The Circuit of Nevers Magny-Cours will host the WorldSBK until 2022. 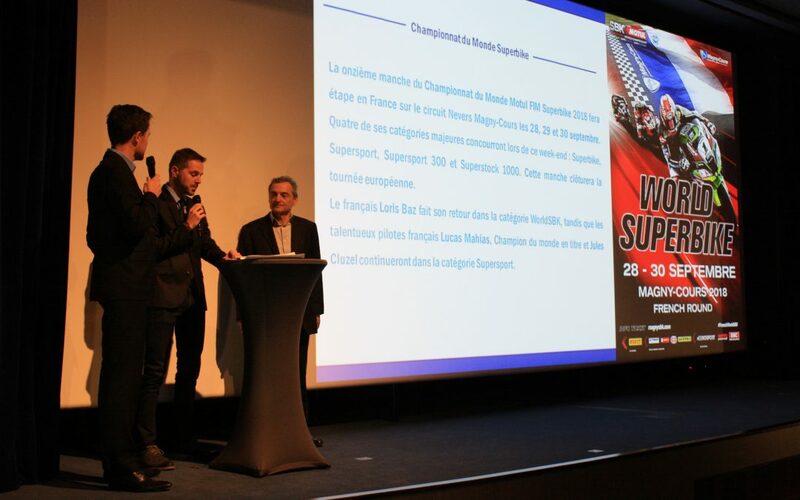 The Circuit of Nevers Magny-Cours and the Organisation Dorna WSBK are delighted to announce a contract extension, which will see the French circuit host the FIM MOTUL Superbike World Championship until 2022, following a press conference in the presence of Serge Saulnier (Chairman of the Board of the Circuit), Daniel Carrera (Executive Director, WorldSBK), Marc Saurina (Director of Sales and Marketing, WorldSBK) and Loris Baz (Gulf Althea BMW Racing Team). History was made at the French round in 2017, the weekend seeing Jonathan Rea (Kawasaki Racing Team) crowned WorldSBK champion for the third consecutive time, and becoming the first rider to achieve this. The Circuit of Nevers Magny-Cours has been home for the French round since 2003 and offers fantastic races for French spectators as well as for international fans. It will continue to host the WorldSBK races until 2022, which is an exciting prospect for everyone. Serge Saulnier, Chairman of the Board of the Circuit added: “Securing the presence of the WorldSBK at Magny-Cours for the next five years is a mark of mutual confidence for the future of this discipline”. Daniel Carrera, Executive Director of WorldSBK, explained: “Continuing to organize this event at the French circuit of Nevers Magny-Cours over the coming seasons was an easy decision to make. We look forward to returning to France over the next five years, to organize a global event in fantastic conditions, with really enthusiastic fans and a motivated team.